It must be obvious by now that I am a lazy blogger – it looks like I settled down to a comfortable and boring average of one post per month. But. I got back my WoGE-mojo yesterday, and bumped into Peter’s WOGE screenshot while gliding over the karstified limestones of the Dinarides in Montenegro. 15.05N – 83.28W: beach ridges in the northern lobe of the Rio Coco delta in Hounduras on the Caribbean shore. This looks to be a nice example of cuspate delta with symmetrical lobe construction around a single channel. In retrospect, maybe I should have invoked the Schott rule :).The main reason for choosing this place was the little river channel that is desperately trying to get to the sea, but it is always diverted by the beach ridges with sand coming from the mouth of Rio Coco.The abundance of relic shorelines and the predominance of a single river channel makes this a nice example of a wave-dominated delta — although the river seems powerful enough to get pretty far out into the open sea. You can also detect a slight asymmetry: the southern side is somewhat smaller and seems less sandy than the section north of the main river (you need to look in Google Earth to see this, or, even better, this image). 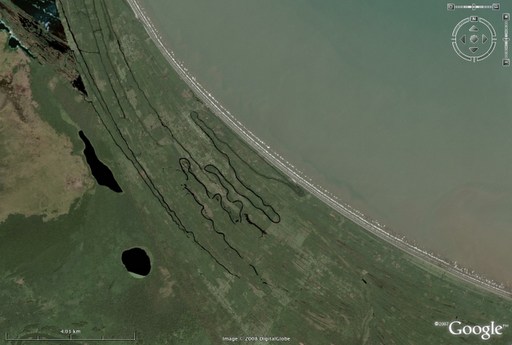 The related sediment plume reflects this asymmetry as well: more sediment is going to the north of the river mouth, most likely due to northward oriented longshore currents.Another example of asymmetric delta lobes is in the Danube Delta – see WoGE #62.In any case, #139 is back to you, Peter. WoGE #139 is posted, good luck!